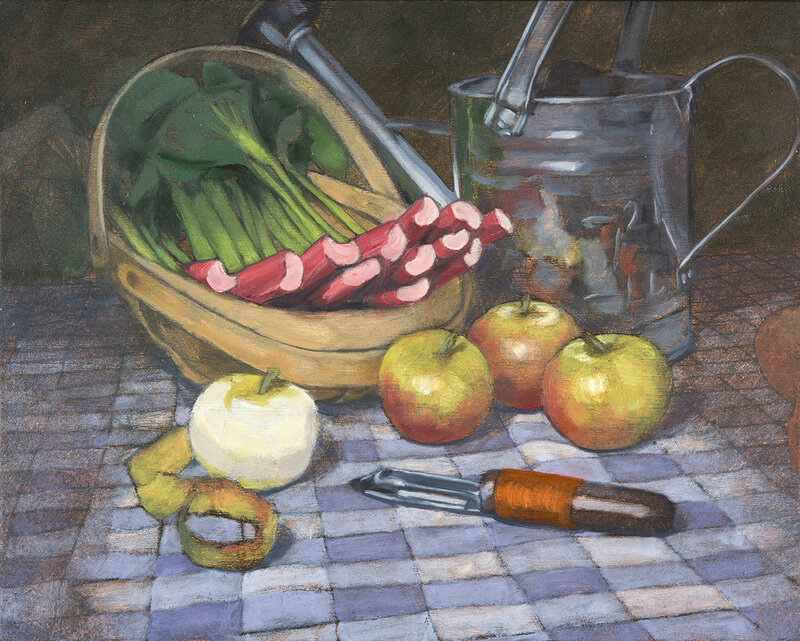 'Seasonal Fruit & Veg' by Rob Lunn. A commission from Paint & Draw magazine, the brief was to paint a scene of seasonal fruit & veg for the cover of issue 5. 8" x 6", oil on board. Rob Lunn Fine Art © All rights reserved. 'Cezanne's Apples' by Rob Lunn. Commissioned by Paint & Draw magazine for a ‘Paint like Cezanne’ step-by-step workshop in issue 1. 6" x 8", oil on board. Rob Lunn Fine Art © All rights reserved. 'Scrum of Toms' by Rob Lunn. Tomatoes are one of my favourite foods so it was really fun to paint this one. 6" x 6", oil on board. Rob Lunn Fine Art © All rights reserved. 'David and Goliath' by Rob Lunn. Featuring Haphazard Harmony ceramics by the dutch designer, Maarten Baas, this little still-life is all about sugar, and my imagined battle between natural over processed. 10" by 10", oil on board. Rob Lunn Fine Art © All rights reserved. 'Yellow Pepper 33' by Rob Lunn. I love painting peppers, I could paint them till the cows come home. With this one I wanted to literally get inside the pepper and paint its hidden side. The bit we normally throw away. 6" x 6", oil on board. Rob Lunn Fine Art © All rights reserved. 'Incubating Apricots' by Rob Lunn. Painted over the Bath Artists’ Studio’s Open Studios the title of the painting came from a comment by a member of the public after seeing them composed in my shadow box. 6" x 6", oil on board. Rob Lunn Fine Art © All rights reserved. 'Sweet Pepper' by Rob Lunn. This use of strong complimentary colours is something I teach in my Quick Start Art workshops. Here in ‘Sweet Pepper, I’ve played the blue background against the yellow foreground and the green of the stalk almost acts as a fuse to the fiery red of the pepper’s body. 6" x 6", oil on board. Rob Lunn Fine Art © All rights reserved. 'Yellow Pepper 03' by Rob Lunn. This is the pepper at the heart of my Quick Start Art® Still-life workshops. A subject I've painted hundreds of times and never get bored of. All of painting can be found in a simple pepper! 6" x 6", oil on board. Rob Lunn Fine Art © All rights reserved. Orange Over Board by Rob Lunn. 'Orange Over Board' by Rob Lunn. I wanted to paint 6 oranges in a bowl, but I guess I need a bigger bowl. The escaping orange spoke to me and then the composition was set. 8" x 10", oil on board. Rob Lunn Fine Art © All rights reserved. 'Red Pepper 01' by Rob Lunn. My first pepper, the start of a love affair and a long long line of pepper paintings. You can watch me paint this little beauty from start to finish on YouTube by clicking here. The only stage missing is the charcoal gesture drawing that test the composition. 5" x 7", oil on board. Rob Lunn Fine Art © All rights reserved.